Congratulations. All that blood, sweat and tears rewarded. Bewdiful. I have not, yet, obviously, read your lovely Adelaide - but I have no doubt at all about these kudos being well deserved. Phrew! (said the Phantom) Wow, that's a Hot list. On an another note, I really enjoyed your local hot or not list. Our West is more about Brittany or the Oswalds or Twiggy. Awful. That's a birthday gift for Adelaide in-laws totally sorted, if they haven't snapped it up already. Congratulations Pav. It looks beautiful. And loved. will keep my eyes peeled. Now, must now do my word verification which is "hymeter", which I always thought was an Illyrian cubic kilometre. Congratulations! Where can I buy it? Imprints? On-line? I don't know how these things are timed but the book is officially published next Saturday so I would most sincerely hope there will be stocks in the bookshops by then. 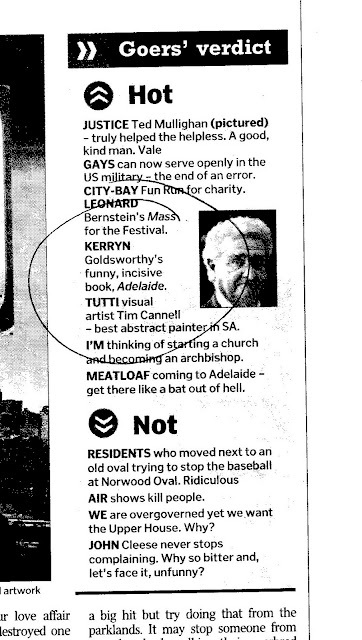 Congrats and nice to see the words "funny", "incisive" and "Adelaide" in the same sentence for once. Hmm, WV seems to think this is a 'unoretur' comment. Nabs, yes, very unoretur indeed. But you live in Melbs so allowances must be made for you. You are all being extremely nice. Lynne, is that you? I will make it to a concert one of these days -- I have good intentions every time! Yes, it's me. Big concert on 19 November - Stella Natalis by Karl Jenkins. Can't wait to read your book. Must go to Imprints and put in an order. I've put Nov 19 in my diary. One for yours, in the unlikely event that you're in a position to listen: I'm on Margaret Throsby's show on Oct 19. My planned playlist is full of Adelaide musicians and/or associations. Any suggestions or requests? Hmm. I'd have to think about that. By the by - I've just had a call from Imprints. It's arrived!